It's been a while since I last wrote any real tutorial. I wanted to write this tutorial for a while, but was delayed due to updating my own apps, and creating new apps, and also due to relatives who got seriously ill, yadda yadaa, whoop dee doo whoop dee dye and so forth. Anyway, today I'd like to show you how you can create a custom sized horizontal UIPickerView. 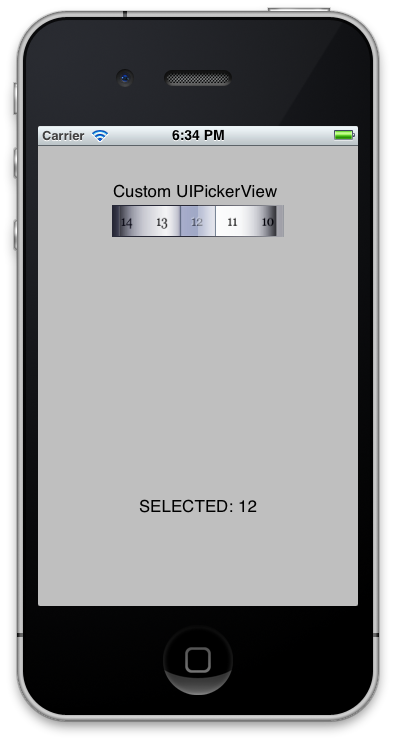 UIPickerView is an awesome object to display a list of items. While you can accomplish this using UIScrollView easily, the behaviour of UIPickerView is slightly better because the items in UIPickerView is auto selected when user chooses it - that cool spring effect centers the selection nicely at as well. Basically we're just declaring our UIPickerView as IBOutlet (nothing new in declaration method here). We also added a NSMutableArray so that we can manipulate our items and be able to add our items in the pickerview easily later. We also add UIPickerViewDelegate at the interface because we will be using the built in Delegate functions of UIPickerView object. myFish holds 15 variables. from 0 to 14. (Remember index of an arrays always start with 0). So you can access them by myFish = Tetras; myFish = Rasboras. And so on. But you are limited to 15 fishes. This is where NSMutableArray differs, an NSMutableArray is an array that is mutable, or expandable/changeable. So if you declare myFish as an NSMutableArray, then you can have up to whatever value you wish, so long as you be careful not to overload it (memory issues). So now you have declared the UIPickerView, go to Interface Builder and connect BOTH the "delegate" and "Referencing Outlet" to the FileOwner. you want. "Component" is the scrollable object in a pickerview. For example, a date pickerview has 3 components where user can select each of date, month and year. For our case, we are going to use just 1 component. you need to use switch (or if) statement to specify for each components. In our case we just have 1 component, so we only return the item count of our array. This delegate is always called when user selects an item. Write the actions you'd like to happen when user select something in here. Remember that delegate functions must be written as it is, EXACTLY. Any deviation might cause it not to work. Do check Apple docs for the latest delegate function names in case your implementation does not work. 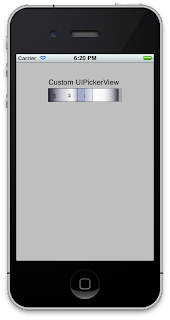 Next is the fun part, customizing the UIPickerView. We will add the customization code in the viewDidLoad as we want it to be customized after the view is loaded. Write the codes below in the viewDidLoad. // this, then the delegate functions will not work/be called. // scale transform, and finally setting the pickerview transform. // set the center location. // Here I decided to add UILabel as the item's "object"
// the right/suitable size as for the scale. // UIlabels, each with a text of 1 to 20. Set the other UIlabel's property as you wish. // that we just created above into the array using "addObject" method. That is all there is to it. Run your app and it should display a nice horizontal UIPickerView! Now when you select a row, the label will show you which row you selected. Cool eh? Well, that's it for now. Hope this tutorial helped someone. Good luck! Many Thanks for You tutorial! I used this to make a colored stylish PickerView (not horizontal). But when I change the background color of the UILabel to have a colored picker, the text output is damaged. The letters are limited to single lines on the downside. Only the very 1st disappearing entry on the top is readable. Seems to be a limitation of this technique. that was great help to start me off. How do I use a second component, what is the if statement to set the rows and how do i load it. The Art to Make Your iPhone App Shine!